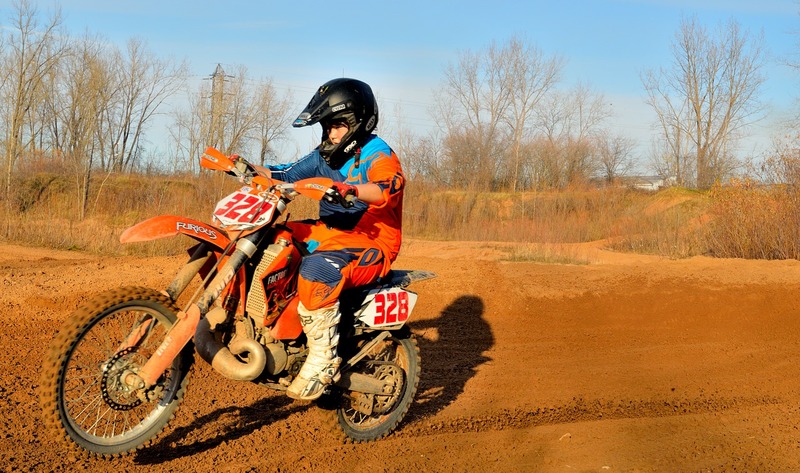 Your child must be physically capable of riding and able to follow dirt bike safety protocol. When a child can get on and off a bike and easily reach the brake pedal and gearshift level, they are physically able to ride. Your child must also understand and be responsible enough for following all rules associated with riding a dirt bike. Having your child's peripheral vision tested is a good idea if they have difficulty perceive peripheral movement, this will cause a danger while riding. Pay attention to the age, height and weight requirements of the dirt bike. Generally speaking, a 6- to 11-year-old can ride and maneuver a bike with a 70 cc or smaller engine. A 12- to 15-year-old can ride a bike with a 70 to 90 cc engine. Buying your child a helmet, riding boots, gloves, and a riding suit that fits properly is a must. Choosing gear that is slightly larger so they can "grow into it" is not advised. Follow the manufacturer's recommendations and buy items that properly fit your child's frame now. Consider enrolling your child in a professional dirt bike riding course. The Motorcycle Safety Foundation offers novice to experienced riders classes. If you plan to teach your child how to ride, the American Motorcyclist Association recommends you stay in front of your child to ensure they're paying attention, use language they can easily understand, and keep emotions and expectations in check. Your child won't master the dirt bike overnight, instead emphasize the importance of safety over the pleasure of riding. Make sure your child's bike has the best synthetic lubricants to run clean and lean. AMSOIL offers Out-Front Performance for dirt bikes. Call Lifetimeoil in Dallas, at 612-819-8835 or shop online for all your synthetic lubricant needs.